If you are a contractor that gets an occasional insulation removal job, this machine is perfect! With good production and an excellent price point, this insulation vacuum will give your business the flexibility to take on retrofit and insurance jobs. I bought my first Insulation Blower Machine CM1500 from Barry. Barry was very professional and responsive to my phone calls also he helped me to choose right machine with asking me all the question. As I grew my business, I needed an Insulation vacuum machine, and needless to say who do I buy from is Barry! Again he was very helpful with all questions and concern and choosing right machine. I say if you need any insulation Barry is the guy you want talk to. A A generous, 6 inch opening and turbo-blades combine for high volume production that matches blowers with more horsepower. Economy 11 h.p. Briggs/Stratton engine with manual pull start (electric start option). 18 inch dia. abrasion resistant fan blade, 3/16 thick blades w/ solid robotic welds, dynamic computer balanced, turbo-sonic FC fan blade. Weight 190 lbs. Dimensions 32 long x 26 wide x 37 high. Add another vacuum, in-line to increase performance and reach much longer lengths. 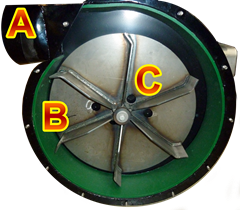 Read this article for more information about daisy-chaining vacuums together. The inlet and outlet are 6. See this article on our various recommended vacuum hose configurations (Minimal, Economy and Deluxe). The CoolVac11 has now replaced the CoolVac12. This video is a walk around of the older machine. There is no performance difference. The older machine had a LTE engine which sometimes made it difficult to find service. The 11hp Briggs/Stratton is a great performer. Our original vacuums had replaceable liners. This video shows how to replace the liner. Now, we have incorporated a 1/4″ hardox steel liner in all of our vacuums. You no longer need to replace the liners.